The University of Toledo and WGTE will present “Native America: Cities of the Sky,” an advanced screening of the new PBS series to air this fall. The free, public advanced screening will take place Monday, Oct 8, at 6:30 p.m. in the Driscoll Alumni Center Auditorium. 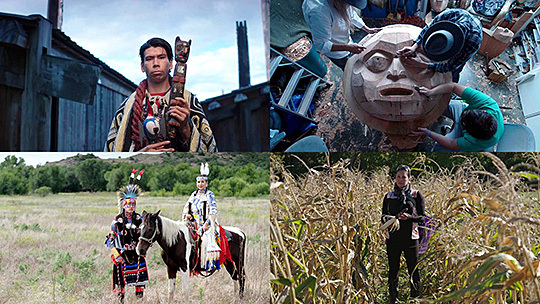 This “Native America” promotional photo from Providence Pictures shows, clockwise from top left, Alan Hunt preparing to become a Kwakwaka’wakw Hereditary Chief; Potlatch cedar carving; Onondaga tribal member Angela Ferguson; and Comanche tribal members Philip Bread and Jhane Myers. The premise of the new series is to weave history and science with living Indigenous traditions, bringing to life a land of massive cities connected by social networks spanning two continents. “Native America” is narrated by Robbie Robertson, Mohawk and member of the rock group The Band. Each hour of the series will explore Great Nations and reveal cities, sacred stories and history hidden in plain sight. Dr. Melissa Baltus, an archeologist and UT assistant professor of anthropology, is excited about the series. She added that people would be interested to hear about the similarities and differences in ancient cities in the Americas, as well as the engineering and astronomical achievements of past peoples. The producers of the show were given access to Native American communities, going behind the scenes at special events, including a pilgrimage to ancestral ruins at Chaco Canyon in New Mexico. The show will premiere on PBS Tuesday, Oct. 23, at 9 p.m. Eastern Time. This entry was posted on Friday, October 5th, 2018 at 3:31 am and is filed under Arts and Letters, Events, News, UToday .